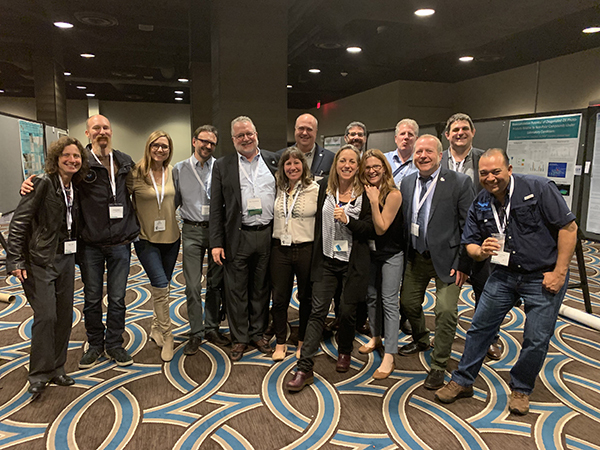 FEBRUARY 8, 2019 — The Office of Response and Restoration had strong participation in this year’s Gulf of Mexico Oil Spills and Ecosystem Science Conference (GOMOSES). OR&R staff with partners from U.S. Coast Guard, Woods Hole Oceanographic Institute, NOAA NESDIS, and EPA. Image credit: NOAA. The conference was held in New Orleans, Louisiana, from February 4 through 7, and was sponsored by the National Ocean Service. The GOMOSES conference, nine years after the Deepwater Horizon oil spill occurred, was an opportunity for OR&R staff to listen to academic, federal and state stakeholders, as well as an opportunity to strengthen partnerships and highlight OR&R’s continuing role in advancing the science of oil spill preparedness, clean-up, damage assessment, and restoration. OR&R was well represented; from Office Director Dave Westerholm’s role on the Executive Committee, to OR&R’s many presentations, panelists, posters and meetings with partners. OR&R shared scientific advancements on modeling and remote sensing of oil. OR&R co-presented with University of New Hampshire’s Coastal Response Research Center (CRRC) and contributed to innovative presentations with other NOAA offices. These included NOAA’s Restoration Center (RC), National Environmental Satellite, Data, and Information Service (NESDIS) Satellite Analysis Branch, and National Center for Coastal Ocean Science (NCCOS). NOAA’s Deepwater Horizon Long-Term Data Management Team (OR&R and RC staff) recently sponsored two workshops facilitated by Dr. Kinner from the CRRC. The workshops were organized with the National Academies of Science, the RESTORE Council and NOAA’s National Centers for Environmental Information. The workshops brought together scientists and managers from across the Gulf of Mexico spanning federal, state and local agencies, as well as academic institutions. GOMOSES presented the opportunity for NOAA and the CRRC to highlight updates on the gulf-wide long-term data management coordination and the forthcoming report from CRRC. A panel discussion focused on next steps for continued collaboration and developing ways to improve long-term data management and sharing. Several presentations highlighted the use of new tools, such as NOAA’s DIVER data management application and ERMA visualization tool. Staff was able to learn about what other groups have been working on, and to identify specific needs for oil spill science to support the OR&R mission. For more information, please contact Ben.Shorr@noaa.gov or Doug.Helton@noaa.gov.